American Humane and Chicken Soup for the Soul Pet Food bring half a ton of free, premium food for animals transported out of the path of deadly storm. 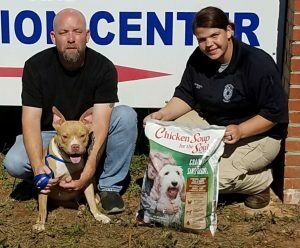 American Humane, the country’s first national humane organization, and Chicken Soup for the Soul Pet Food delivered 1,000 pounds of caring and love in the form of much-needed nutritious food to shelter animals fleeing the destruction of Hurricane Michael. A truck filled with premium Chicken Soup for the Soul Pet Food dropped off the donation at the Meriwether County Animal Shelter in Greenville, Georgia, which is caring for more than 100 animals, including 40 dogs who they generously agreed to take in after they were transported by the American Humane Rescue team from a shelter affected by the disastrous storm. Thirty-two of the dogs have already been reported as adopted. American Humane drove one of its giant 50-foot animal emergency vehicles more than 600 miles to pick up animals and take them to safe ground where they can find forever homes. This is the latest donation in an ambitious national campaign called “Fill-a-Bowl… Feed-a-Soul™” to help care for shelter pets waiting for their forever homes. Together, American Humane and Chicken Soup for the Soul are distributing more than million meals annually of all-natural Chicken Soup for the Soul Pet Food to U.S. shelters and pet food distribution centers, which house, feed and care for millions of animals each year. American Humane is the country’s first national humane organization, founded in 1877. The American Humane Rescue program has been involved in virtually every major relief effort during the past 100 years, starting in World War I when we rescued and cared for 68,000 war horses wounded each month on the battlefields of Europe, the Great Ohio Flood of 1937, Pearl Harbor, Hurricane Katrina, the terror attacks on 9/11, the Japanese earthquake, tsunami and nuclear disaster, Superstorm Sandy, the tornadoes in Joplin and Oklahoma, the Louisiana and West Virginia floods, the California and Tennessee wildfires, and most recently, Hurricanes Harvey, Maria, Irma, and Florence. To support American Humane’s rescue efforts, please visit www.AmericanHumane.org.